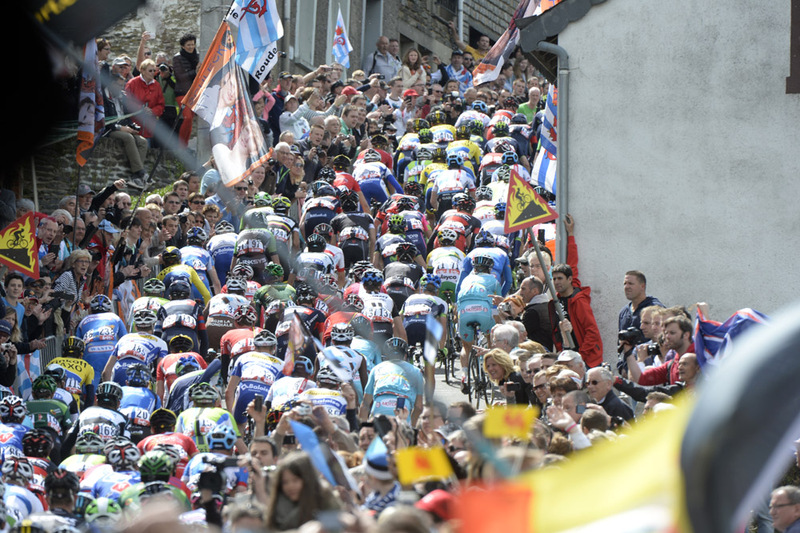 You have to wonder at what point Simon Gerrans’ rivals realised they’d made a mess of Liege-Bastogne-Liege. They had 262.7 kilometres of hilly roads to get rid of him, before the final flatter 300-metre straight leading to the finish line. Was it at 18 kilometres to go, when a strong 10-rider group of favourites, 50 metres off the front of the peloton after the Cote de la Roche aux Faucons, fell apart under the weight of its own potential? Was it at 10.5 kilometres to go, when Gerrans’ Dutch team-mate Pieter Weening went to the front of a still 50-strong peloton and led it, in single file, through the streets of Liege, preventing any attacks? Was it over the top of the Cote de St Nicolas, when the only attack to go clear was a two-up move by Ag2r and Katusha lieutenants Domenico Pozzovivo and Giampaolo Caruso? Or was it at the point, at 200 metres to go, that Gerrans ripped himself from Alejandro Valverde’s back wheel and proved that in a finish like this, the Australian has no peers? To speak of his rivals losing Liege-Bastogne-Liege, rather than him winning, is unfair to Gerrans, however. His victory in the race has been a long time coming – in the last six editions of the race, he’s come sixth, 11th, 12th, 19th, 10th and finally first. While he’s not been quite strong or lucky enough to win it in the past, he’s been close enough to the front to watch closely how others have done so. More importantly, his Orica team took responsibility for shaping the race in his favour – Weening worked hard, along with Movistar, in the final 10 kilometres to the foot of the St Nicolas, then Weening and Simon Clarke led the bunch into the climb. Weening was at the front again up the final drag through Ans with 1.5 kilometres to go, slowly pulling the peloton back to Caruso and Pozzovivo. Then, when the front of the bunch fragmented under the pressure of Dan Martin’s final-kilometre attack, Gerrans hauled himself up to Valverde’s back wheel. There was still work to do, at this point. Two riders, Caruso and Dan Martin, were a dozen metres ahead of Valverde and Gerrans into the final corner. Martin’s hopes of winning were dashed when his bike slid out from underneath him, while Caruso was caught with only 75 metres to go. Romantics might well have been rooting for Martin and Caruso, respectively the unluckiest and pluckiest might-have-beens of the race. But Gerrans’ riding style is as pragmatic and unromantic as cycling gets. On this day, Gerrans’ ice extinguished their fire. Could Martin have won, had he stayed upright? He’d caught and would have passed Caruso. Caruso was only a few lengths behind Gerrans at the finish, in fourth place. It will be no consolation to the Irishman that it would have been extremely close. But ultimately, Martin and Caruso are two of 198 starters who didn’t win the race. They just happened to be two of the most visible. Gerrans, on the other hand, was invisible, until exactly the right moment. The 100th edition of the race was an uncharacteristically tame one. A long-range break went, and their lead went from zero to 15 minutes to zero again over 230 kilometres. But the killer sequence of climbs in the last 50 kilometres – La Redoute, Forges and Roche aux Faucons – didn’t draw out the favourites, who preferred to hide away and do battle by proxy. Julian Arredondo of Trek and Pozzovivo attacked over the Roche aux Faucons, and Samuel Sanchez of BMC might have bridged, except he attacked far too late up the climb and simply gave his chasers something to aim at. Behind Arredondo and Pozzovivo, eight riders did go briefly clear, including Valverde, Amstel Gold winner Philippe Gilbert, 2013 Fleche Wallonne winner Daniel Moreno, Amstel runner-up Jelle Vanendert, and 2013 Amstel winner Roman Kreuziger, plus Belkin’s Lars-Petter Nordhaug and Astana’s Enrico Gasparotto. When Omega Pharma’s Michal Kwiatkowski and Ag2r’s Romain Bardet also bridged across, it looked like the strongest riders in the race had finally come to the fore. But instead of pressing on, they started looking at each other. A bit of foxing and freewheeling later, it had all come together, and Weening took over for Orica, catching Arredondo and Pozzovivo in Liege. Pozzovivo went again on the St Nicolas, this time with Caruso, and the biggest surprise was that none of the favourites felt that this would be a good time to go, especially with Gerrans still in the front group. Dan Martin made a brief dig over the top of the St Nicolas, setting off a pattern of attacks, chases and truces which slowed the peloton but allowed Pozzovivo and Caruso a 20-second lead. Even through the streets of Ans, the only significant attack was from Belkin’s lieutenant Nordhaug. Up the final drag inside the final kilometre, Martin attacked. Kreuziger took responsibility for chasing, even though he was probably riding himself out of a top five position by doing so. Gilbert attempted to attack, but couldn’t hold his effort, even though he pulled the peloton slightly closer. Valverde took over, with a strong effort. All the while, Gerrans bided his time. He stuck to Valverde’s wheel up the final climb with single-minded focus, even as Martin and Gilbert made their attacks. After 263 kilometres, 10 major climbs, and six and a half hours of racing, the 100th edition of the hilliest Classic of all had come down to a bunch sprint. In the end, it was no surprise that the best sprinter in the field won.